Government records are fundamental to understanding official policies and the decision-making processes of our leaders. They can be vital resources for a journalist following a breaking news story about government misconduct, a military veteran’s family seeking information about benefits, or a student writing a history paper. Government documents provide first-hand, real-time accounts of events as they unfolded, generally without the editorial filter that characterizes secondary sources like books and news articles. 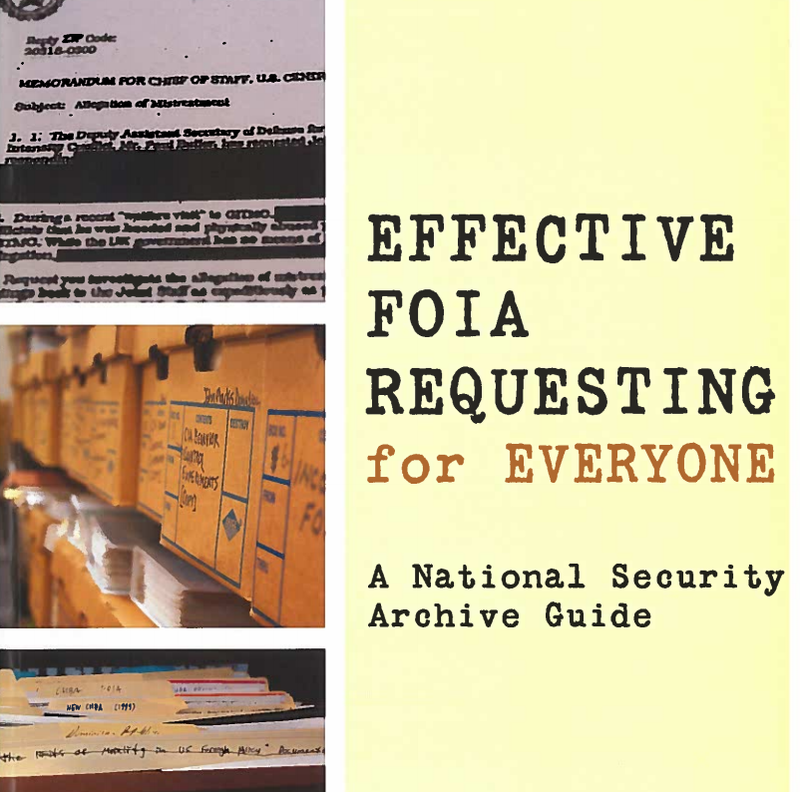 This guide, Effective FOIA Requesting for Everyone: A National Security Archive Guide, provides a comprehensive overview of how to obtain documents from federal executive branch agencies. It focuses primarily on the Freedom of Information Act process. But it also briefly treats other means of accessing government records, including through publicly available sources and through the Mandatory Declassification Review (MDR) process for obtaining previously classified records. The guide is available electronically in PDF form. Use the links below to download the full guide or individual sections. The outline describes the content of each chapter, which can be downloaded in smaller PDF files by clicking on the linked title for each chapter or section. Chapter 1 - Introduction: What is the FOIA? What Records May I Request? Where Do I Send My FOIA Request? What is Mandatory Declassification Review? Should I Use MDR or FOIA? How Do I Appeal an MDR Denial? What Issues May I Litigate? When May I File a FOIA Lawsuit? Where May I File a FOIA Lawsuit? LEGAL NOTE: None of the information contained in this guide should be considered legal advice, nor is the National Security Archive available to provide legal advice. Although we have striven to present accurate and useful information about the Freedom of Information Act in this guide, we recommend that you consult a lawyer if you need professional advice about your particular situation or if you intend to file a FOIA lawsuit.